Ever since I was a little kid, I have wondered why do dogs wag their tails. A dog wagging its tail is one of the most uniformly accepted signs of a dog’s friendliness towards you. Almost everyone has experienced being licked by an excited and friendly dog with a wild tail, crazily wagging and knocking precious objects and drinks off of tables. When a dog is wagging its tail around you, you can be sure that it likes you and enjoys being around you… Right? Well, hang on. It’s a little more complicated than that. While many people are under the impression that dogs wag their tails to express happiness or friendliness, animal psychologists have a bit of a different answer. 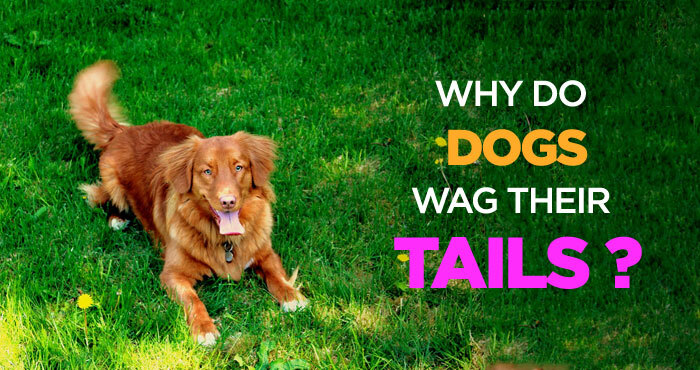 So, exactly why dogs wag their tails? Dog tail wagging usually means friendliness. Not always. Tail wagging can actually mean quite a few different things, depending on how the tail is held. According to the SPCA of America, there are quite a variety of emotions that can be expressed by a dog’s wagging tail, and they’re not all friendly. When a dog is relaxed, it’s said to be in a “neutral” position. The position of the tail depends on the dog – pugs for example have tails that naturally curl upward, while many other dogs have tails that naturally curl downward, with the tail resting behind their legs in the dog’s natural and relaxed states. Researchers at the University of British Columbia, Canada say that tail signals can indicate quite a wide variety of emotional states. So, what exactly is your dog trying to tell you when he’s got his tail between his legs, or when he’s wagging furiously enough to reduce your air conditioning bill? The UBC researchers say that when a dog’s tail is low, between the legs and not wagging very much, it is thought to be signifying fear, tension and anxiety in most dogs. A tail which is mid-set or neutrally positioned can be thought of as a “neutral” emotional signal, telling you that the dog is neither particularly alarmed nor relaxed right now. Dog psychologists believe that the height of a dog’s tail can essentially be considered a kind of mood indicator – the higher a dog’s tail, the stronger the emotions the dog is currently feeling. For example, when you come across a dog with a tail pointing straight up, watch out! This dog is very alert and possibly feeling aggressive. On the other hand, when a dog has its tail between its legs or underneath its body, it is probably feeling submissive, nervous or less aggressive. Dog Tail Wagging – a Blessing or a Curse? One interesting fact is that, just like humans, dog brains are divided into two hemispheres. The left hemisphere of dog brains has been associated with positive and curious behavior, whereas the right hemisphere has been associated with avoidance, nervousness and aggression. Again, just like humans, the left-brain controls movements on the right side of the body, and vice-versa. They express their emotions, both good and bad, through their body and tail movements. Thus, a dog wagging its tail to its left is controlled be the “right brain”, and will be perceived by other dogs and observant humans as being nervous or aggressive. 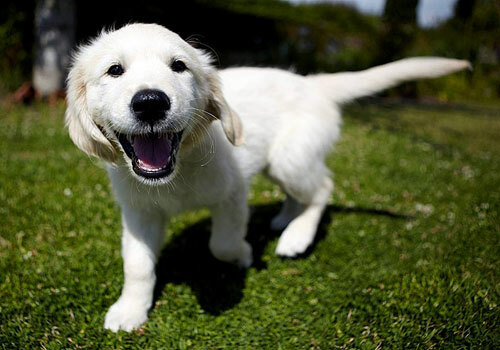 A dog wagging its tail to its right however, may be friendlier and more open to dogs and humans alike. Neuroscientists in Italy have conducted experiments which demonstrated that dogs naturally tend to wag their tails toward the right side of their bodies when they were feeling positive, friendly or generally happy emotions, while they were more likely to wag their tails to the left when experiencing nervous, anxious or otherwise negative emotions. Alright, that’s a lot of science to take in, but what does this actually mean for the average dog owner? So the question then arises, should you be worried about a dog with an unusually active tail wag? Well, just watch the dog! If you’re looking at a dog face-on and his tail is wagging to his right (From your perspective, wagging to the left), it means he’s most likely happy or curious in his current environment. On the other hand, if your dog is constantly low-wagging his tail to his left (Looking head on, to the right), you may have an unhappy puppy on your hands. According to Stanley Coren, PhD., DSc., FRSC and dog researchers at UBC, dogs with docked tails like Rottweilers have trouble expressing “tail signals” with other dogs and even humans. There’s just not enough tail left for dogs and people to understand properly. 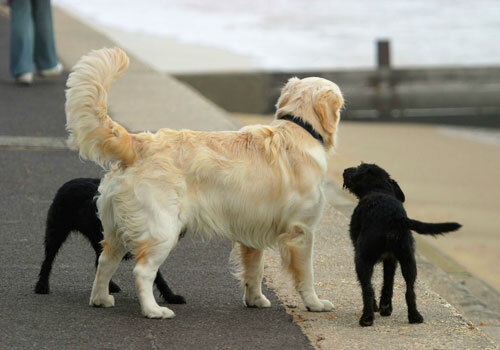 Even though the dogs’ tails wag in the same way as an uncropped tail would, the signals are difficult for other dogs to read and as a result, other dogs tend to be warier or more aggressive toward dogs with cropped tails. This might make for a persuasive argument against tail docking! Besides the height of the tail, the vigor and frequency of the wag also indicates what dogs are feeling. A dog with its tail at a position higher than neutral but lower than vertical, wagging slowly from side to side, indicates that it is feeling apprehensive and distrustful. When the tail is vibrating and perked up high, or flicking quickly from side to side, this is a danger sign that the dog is about to attack or do something wild – grab onto that leash while you can! But of course, there is the good old happy wag, you know the one – where the tail seems to be wagging the dog. Yep – this does mean happiness and security, and is generally a clear signal from the dog that it’s not feeling threatened by you and is happy to have you around. Everyone likes this tail wag! Watch the following video to learn more about what does your dog want to tell you when he is wagging his tail. What Can I Do About My Dog Wagging Tail? So with all that new information, where do we go from here? It seems fairly clear that cropping of dog tails could be a major impediment to communication, so if possible, should probably be avoided. It also seems clear that if we want to develop the best relationships with our dogs, we should be aware of their body language as much as we would if they were a human! So, watch what your dog’s tail is doing! The next time your furry friend knocks your flower vase off the table with his weed-whacker tail, you can at least be sure he really is happy to see you! I wonder if your diagram of right vs left is correct? 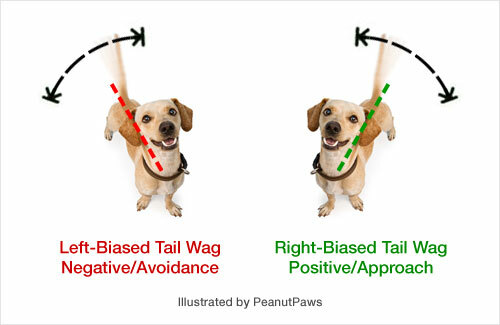 The “right based tail wag” diagram actually shows the tail wagging on the LEFT side of the dog. Perhaps I’ve misunderstood, but please clear this up. Thank you for pointing out. It does seem like the image is slightly different then what we intended to show and a little confusing for readers. We will change it. Thanks for heads up. Appreciate it.